Classic Photo Booth Rental Featured in Forbes.com! Forbes.com recently featured Classic Photo Booth with respect to photo booth rental services released in November of 2016. 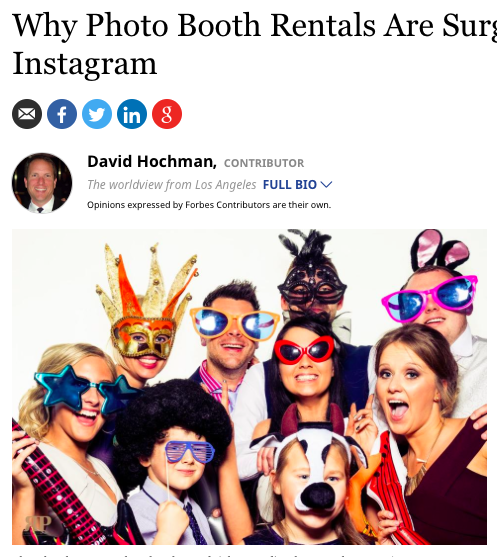 The Forbes article is entitled: Why Photo Booth Rentals Are Surging In An Age Of Instagram. Also focused on why the photo booth rental remains a popular commodity amount event planners. As well in the age of high-tech phone cameras and photo-based social media applications including: Instagram, Facebook and Snapchat. 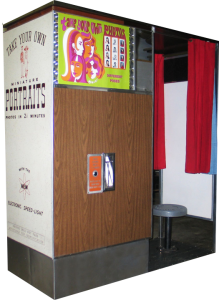 The article stated that the Original classic non-digital photo booth remains popular due to its “classic” or “vintage” appeal. The photo booth experience allows individuals to feel closer and brings the younger generation (who may have never seen the non-digital photo booth in public) excitement! The photo booth rental article further notes that We can use the photo booth in corporate marketing strategies and connected with new-age technology such as iPads. Our photo booths are completely customizable to any marketing campaign. This includes photo booth custom wrapping and the ability to include the company logo or marketing theme on the photo itself. Promoting brand awareness is the main focus of most marketing campaigns. Just think, since most people keep photos as keepsakes for years, the photo booth facilitates brand awareness. The end-user (customer) further has a favorable experience with the brand. The brand is spread to family, friends, co-workers, etc. and further promotes brand awareness. The Forbes.com article then goes on to answer common questions regarding photo booth rentals. These include: pricing options, black & white or color photo options, background options, and more. Other common questions, in our experience, include alternatives to the classic photo booth (including the digital photo booth rental) and green screen rental options. If you have any questions regarding the photo booth and/or other rental, please fill out the contact us by info@classicphotobooth.net or call us at 800-671-8815, we would be happy to answer any and all questions you may have.